It seems everything is coming up glitter this season, and it's now the perfect time to pull out something from your closet, dust it off, and give it a brand-new coating of bling to liven it up! The glitters from Tulip range from super-fine to chunky and come in a variety of on-trend colors, lending themselves easily to a quick and simple project. With just a little glue and a stencil, you can create a fashion-forward piece from something oh-so last-season. 4. 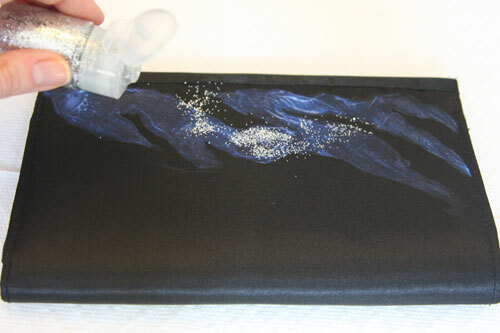 Tap the clutch to distribute the glitter, and use your finger to press glitter into anywhere that looks sparse. If there's glitter in any places you don't want it, remove by scrubbing with a dry cotton swab. 5. Allow to dry. 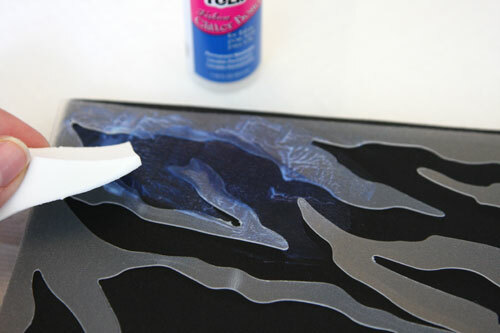 Clean the stencil by wiping with a paper towel soaked in rubbing alcohol (water won't get the sticky bond off the plastic). You're done! Pair with all neutrals to let the design pop, or even take it one step further with the addition of rhinestones or other embellishments! 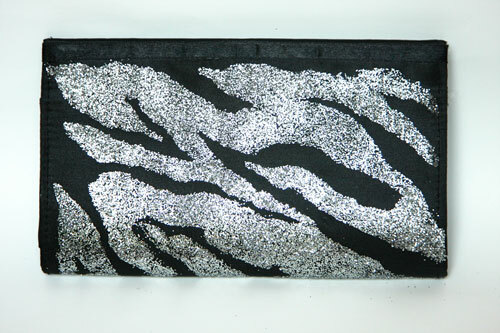 cool, clutch - but how do you keep the glitter from getting all over you? I absolutely love this! 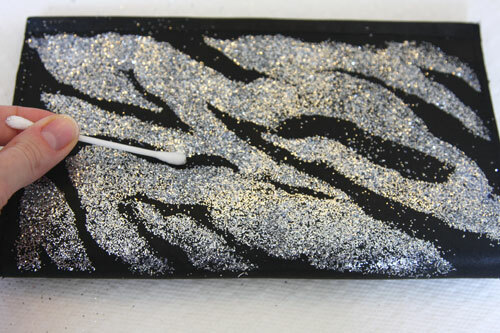 I have been obsessed with all things zebra lately! @Jackie: Thanks! 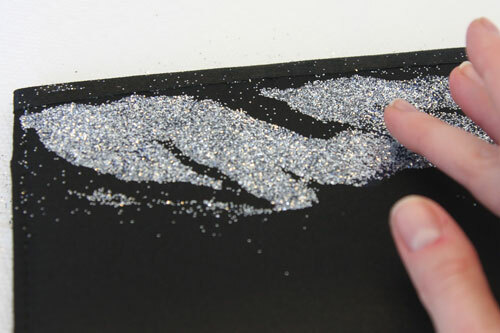 Unfortunately the glitter does get all over - it's very fine-milled - so you just have to be very careful when pouring it onto your project, use only one hand or a couple fingers to spread it out, and wash your hands afterward to clean up the excess glitter. After the glue has dried, it's pretty well fixed onto the fabric, though some does come off with use. Visiting from TT&J & I love glitter! Such a cute project. I'd love to have one of these! And I don't mind glitter everywhere... I'm a face painter! OMG, my daughter would love that bag. I have to show her this project. Totally something that would be great for her. I wonder if there is some sort of sealer to keep the glitter from wearing away to quickly? The animal-print stencils in the tie-dye kit "Wild Thing" are incredible: you get Giraffe, Zebra, and Leopard; they're plastic so they can be wiped clean and re-used, and totally in fashion! My mind is spinning coming up with great new possibilities for them! Maybe a light coating of spray sealant? Aleene's makes a Spray Acrylic Sealer (http://www.ilovetocreate.com/ProductDetails.aspx?name=Aleene%E2%80%99s%C2%AE%20Spray%20Acrylic%20Sealer%E2%84%A2), though I'm not sure how well it would work on a fabric clutch like the one I used. This is so awesome. My daughter would love to make something like this.